Nate Clark is the Associate Director of Corporate Citizenship for John Deere and the Vice President of the John Deere Foundation. In this role, Nate supports the work of John Deere’s corporate citizenship team and the John Deere Foundation by creating, developing, and sustaining non-profit relationships and programs that improve the quality of life for people around the world. Since joining John Deere in 2004, Nate has served in several positions of increasing responsibility including manager of tactical marketing for John Deere Forestry; director of public affairs for John Deere’s Construction & Forestry Division and John Deere Power Systems; and senior attorney. 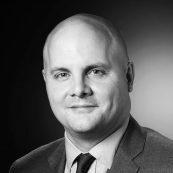 Prior to joining John Deere, Nate worked as an associate at Lane & Waterman LLP and as a judicial clerk on the Arizona Court of Appeals. Nate earned a juris doctor from the University of Iowa College of Law in 1999, and he earned a bachelor of arts from Boston University in 1996. Nate lives in Bettendorf, Iowa, with his wife, Melissa, and two children, Spencer and Harper.